A proper shoe storage system is a must for every home, whether you have a big collection or just a few pairs. It’s surprising that even with all the different options to choose from it’s still difficult to find the one that makes sense for you and your home. That being said, we believe that a DIY shoe rack can solve a lot of problems, whether you prefer a shoe cabinet or something small and inconspicuous. Check out the ideas below if you need a bit of inspiration. One idea is to build the shoe rack in a cabinet-like style, with narrow shelves for regular shoes and tall compartments for boots. You can give it a wooden top slightly wider than the actual cabinet so you can also use this piece as a console table for the entryway. This stylish DIY shoe rack is actually pretty versatile and you can place it in pretty much any room. If you’re not too particular about the design you can build something out of leftover material from previous projects. Check out these shoe storage shelves that are just perfect for the garage. The design is definitely pretty rugged but that’s what the intention was from the start. Of course, it’s all easily customizable so you can make yours look a lot fancier if you want to. 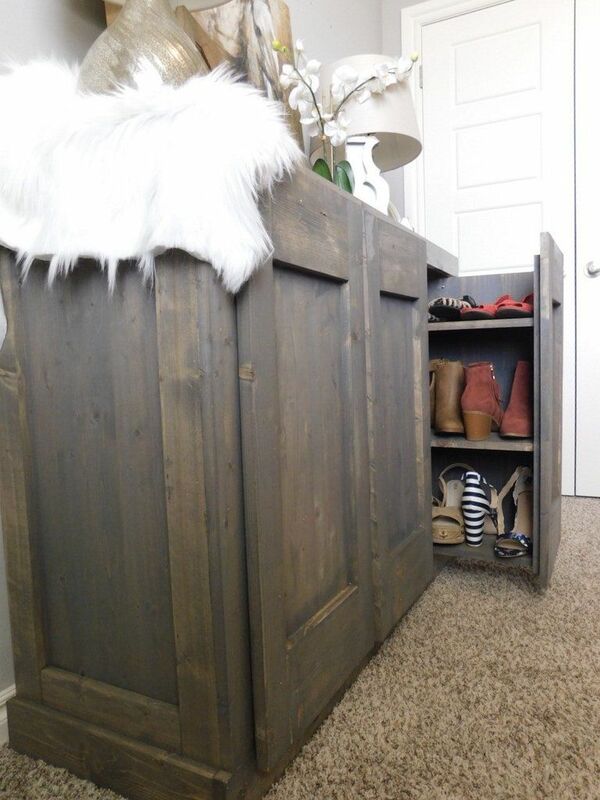 This plywood shoe cabinet from shanty-2-chic definitely has what it takes to make a home feel more complete. The design is simple and putting together the cabinet is easy once all the cuts are made. You can actually also customize the cabinet with your choice of colors or even paint a cool geometric pattern on it using tape. 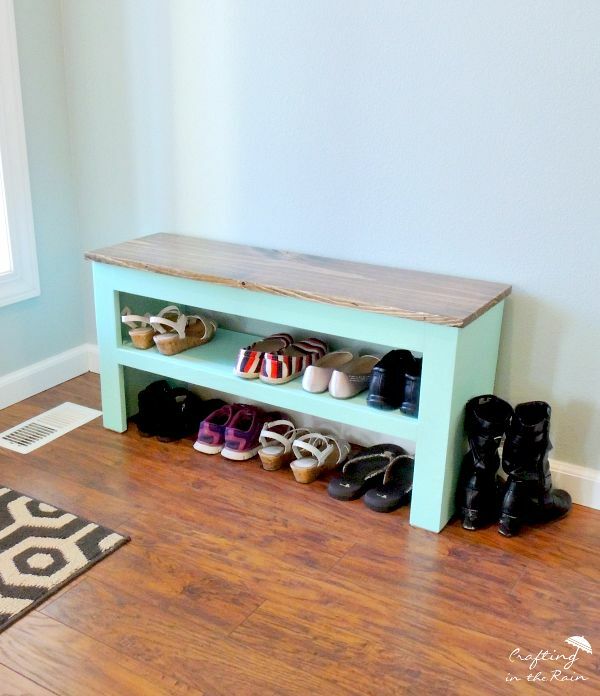 If you feel like a cabinet is too much for you and you’d prefer something smaller, check out this cute DIY shoe rack which doubles as a bench. You can find the plans for it on craftingintherain. It’s actually perfect for the entryway because it lets you sit down while you put on your shoes. It’s great if you have small kids or if you like comfort in general. A vertical shoe rack is an optimal solution for small entryways or if you simply don’t want to waste any floor space with this accessory. 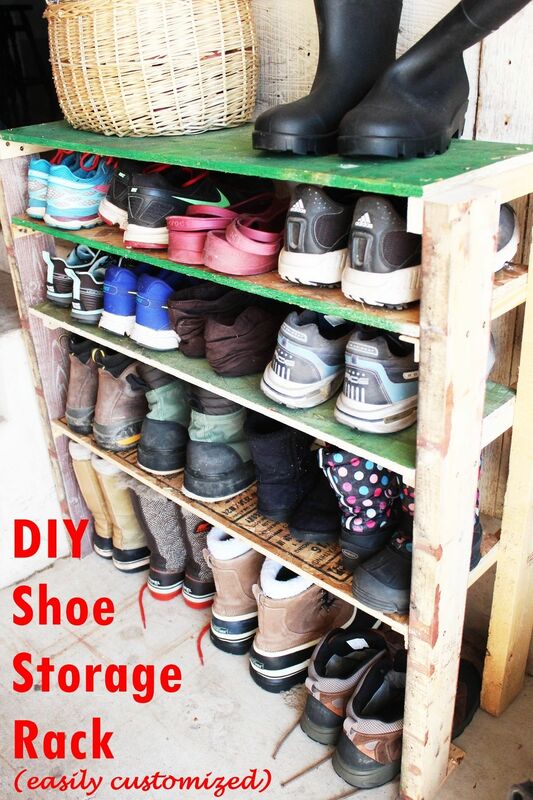 Check out the tutorial on instructables to find out how you can build such a shoe storage system yourself from scratch. It’s easier and more space-efficient than you think. 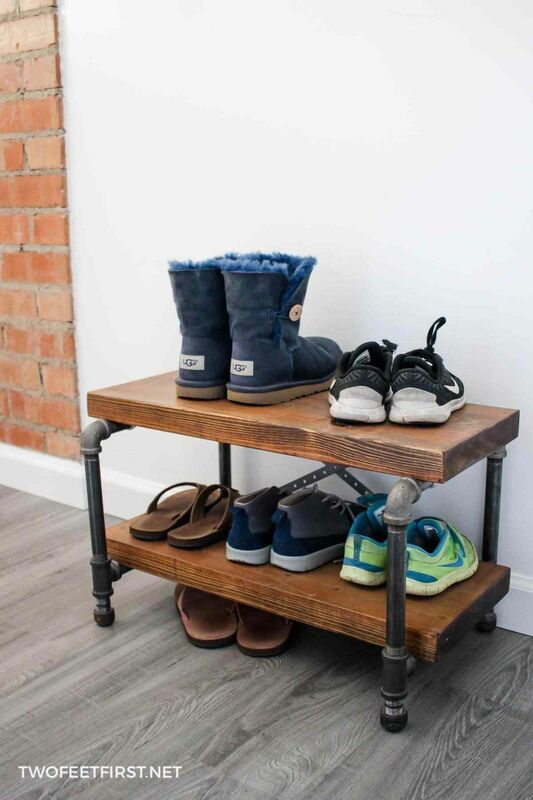 An industrial-style shoe rack is also an option. In fact, this is the type of project that gives you a lot of freedom of flexibility because you can customize it in all sorts of interesting and ingenious ways. You can make these shelves as big or as small as you want or leave as much space as you want to between them. You can also spray paint the pipes and fittings in your favorite color. Check out the details of the project on twofeetfirst. 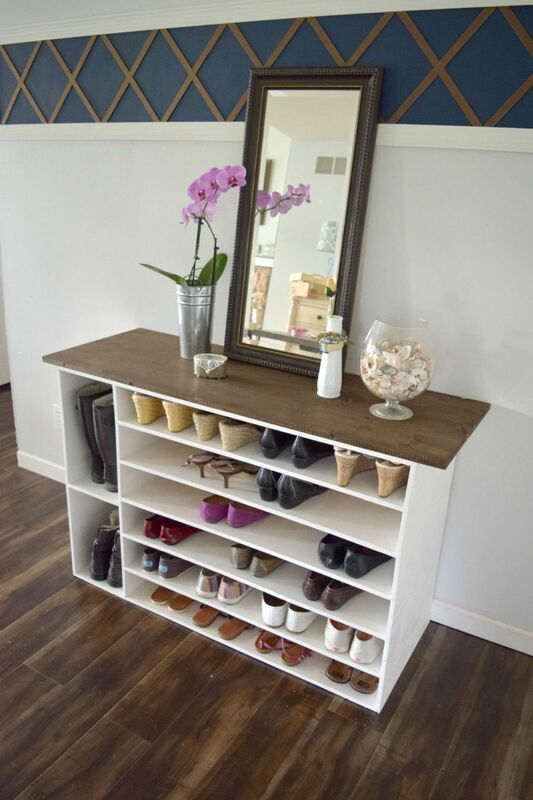 Speaking of industrial DIY shoe rack designs, check out this idea from project instructables which shows how you can build a custom storage and display system for a large collection of shoes, whether it’s for the entryway, dressing room, walk-in closet or some other space. Once again, the combination of metal pipes and wood looks amazing. 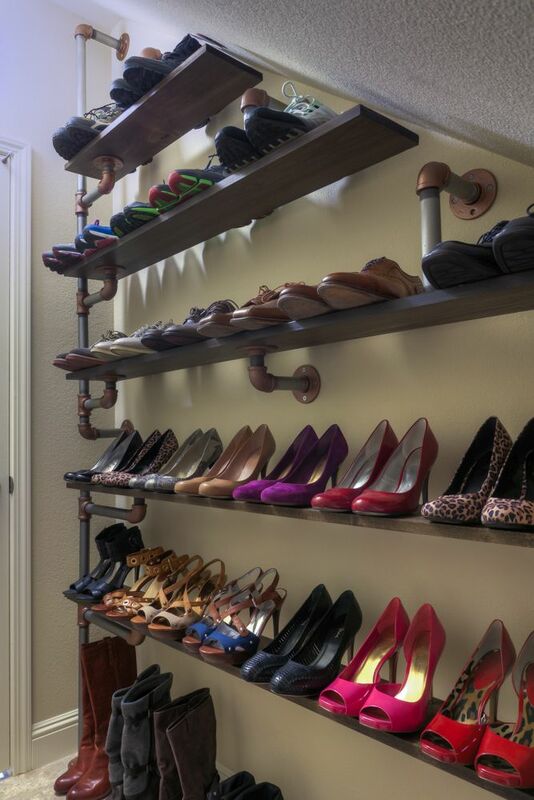 If you don’t want to put all your shoes on display, a hidden shoe rack is also an option, a very valid one in fact. You could build a cabinet with vertical pull-out modules and shelves for different pairs of shoes so you can organize them. This also makes it easy to assign each family member a different compartment. You can find all the details of this project on handmade-haven. Building a shoe rack is pretty similar to building a bookcase except the shelves are a bit angled. The nice thing is that you can customize it so it fits perfectly on your entryway. You can make it as tall as you need to, depending on how many pairs of shoes you have. You can later add all sorts of little details such as labels on each shelf or paint the shelves in different colors. 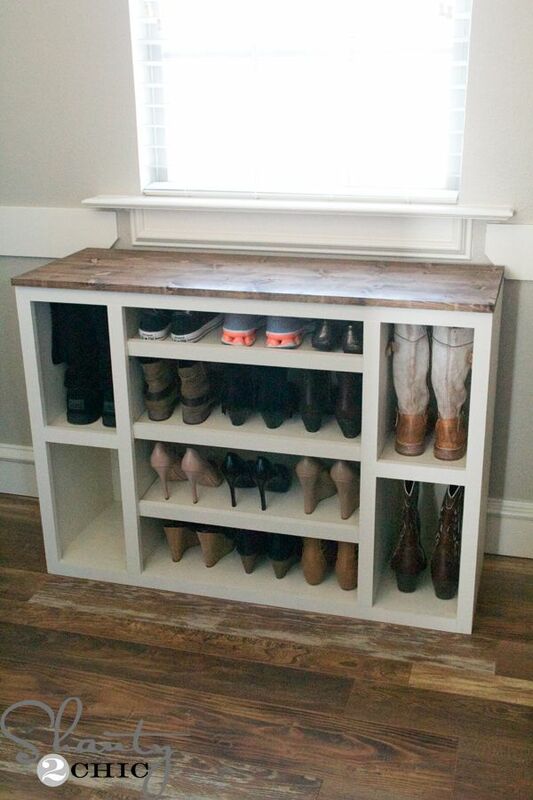 Check out jenwoodhouse to find how to build this shoe rack. It’s possible to want a temporary shoe rack, one that is not meant to be used for too long and doesn’t have to be very sturdy and durable. 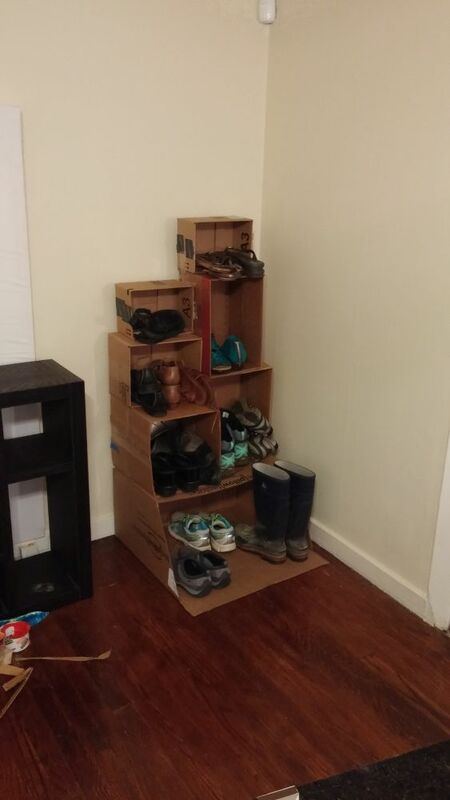 In that case, try building a shoe rack out of cardboard boxes. It’s an excellent idea and a very simple project too. All you need boxes and tape. Don’t worry if the boxes have different shapes and sizes. You can definitely make it work. 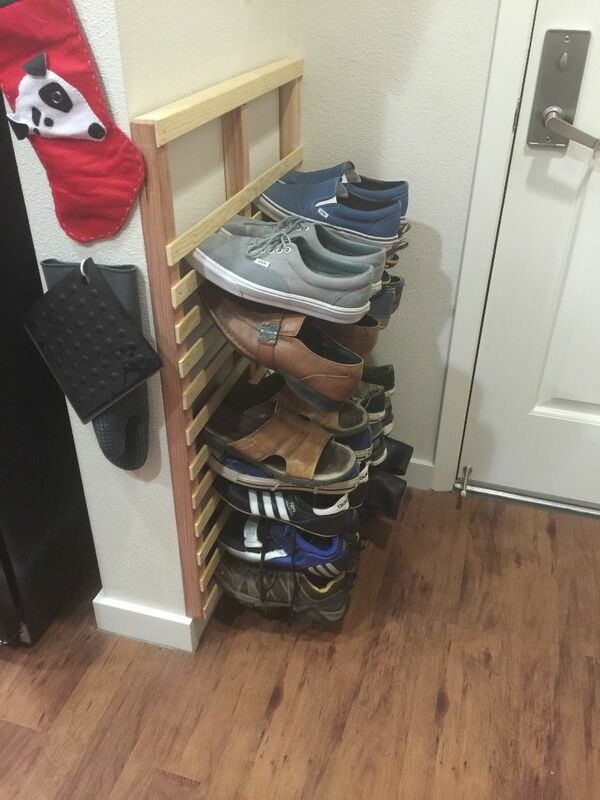 Have a look at this tutorial from instructables to get an idea of how this whole project goes and also to find some inspiration for your own DIY shoe rack. The post 10 DIY Shoe Rack Ideas For The Perfect Entryway Makeover appeared first on Home Decorating Trends – Homedit.